The Princess has had her first real impressions, that is, she had her ears pierced on Saturday. My husband asked me some days ago how old I was when I had my ears pierced. I think I was 12 or 13 years old. I had them done by a doctor for $10. He numbed them with a spray coolant and used a gun. The studs he put in were surgical stainless steel and considered hypo-allergic...and that probably would have been true for anyone without a nickel allergy. Back then such metal allergies where not well recognized, so I did not know why it took so long for my ears to heal, and since I only bought cheap earrings most with stainless steel posts, I just thought that itchy, red, irritated ear lobes after wearing earrings for as little as 30 minutes was just the way of it for me. My mother could wear earrings for days, but my sister and I could not. Not until I met my husband, who gave me a set of 14K gold earrings, did I learn I could wear earrings for days on end without any problems. I even forgot I had earrings in my ears! 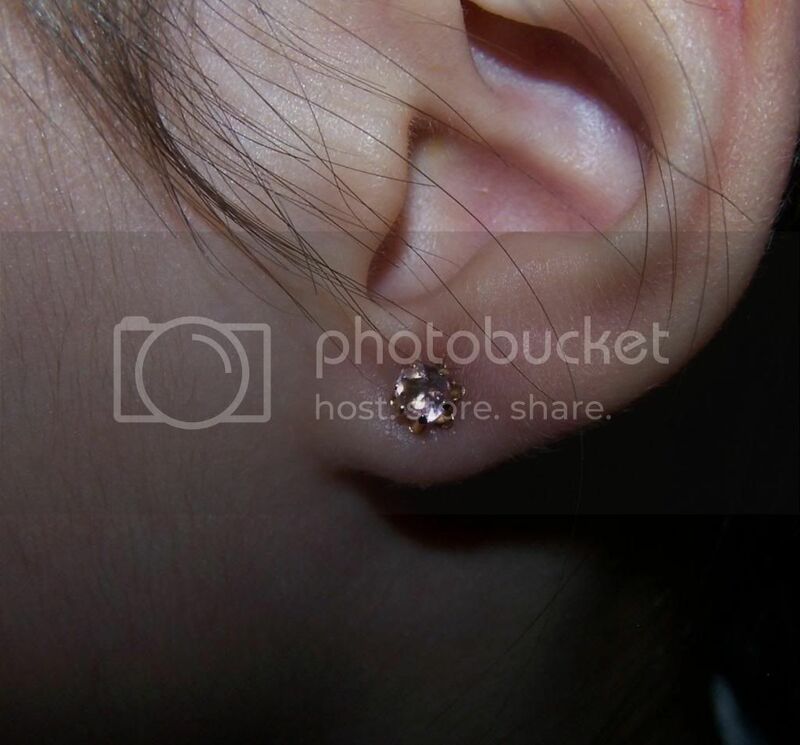 Being concerned that the Princess could have inherited my allergy, we decided we would get her gold earrings for the piercing and after they are healed, she could try the few earrings I still have that are not gold. We went to a well respected jewelry store from where my husband has bought jewelry for me now and then over the years (not in the last five years, but I am not in any need for more). The Princess wanted a deep pink stone, but she approved of a pink tourmaline, which is a light pink. The back screws on with a gold insert into what looks to be a silicone disc: it will be comfortable and not as easy to lose. They cost around $60. Although company had the earrings, they were at the warehouse and not in the store, so I picked them up on Thursday at the end of our errands. My husband had also asked me where we should get the piercing done. I suggested going to a tattoo and piercing place where people do it for a living and not going to the mall or Wallmart where someone could have been hired just last week. I also thought it would be good for the Princess to go to such a place because of some of the things she has said in regards to people who have piercings and tats. Her first impressions of such things has turned a bit judgmental. We did not want her to have piercings and tats, but we also tried not to allow her to develop preconceived ideas about people who had them either. My husband and I have never desired any permanent body art, but I can appreciate the art itself, as a artist and face painter. My husband picked a place nearby that would charge $20 per piercing. We dropped off the earrings for sterilizing at a very clean office. It could have been the reception area of a chiropractor or dentist. They had a screen that showed slides of body art and a few notebooks with samples, but nothing terribly objectionable. When we returned, the earrings had not yet been sterilized and there was a crowd of people! My husband had talked to the man who does the piercings on the phone to make the appointment and told me he was nice. At our first impression, he had tats all over his arms, a few small white ones near his eyes, and stretched earlobes, but his heart left the greater impression; he was very sweet to the Princess. He told her that he had just pierced the ears of his six year old niece last week and had the smaller needle for children's ears. He told us it was good that we came to a professional as the guns used nowadays are more damaging to the skin. He was careful to make sure everything was sterile and marked her lobes to get them even, saying she had the most even lobes he had seen. I held her hair back out of the way. There would be no numbing, but he assured her that it would feel just like a pinch. The first ear was done and she mentioned it hurt, but there were no tears. The second one hurt more, she said, but still no tears. He told us we picked well with gold earrings and excellent backs. He also told us how to care for them to keep them from getting infected. When all was done, the conversation turned. The Princess mentioned that the church had told her that tattoos were bad. I reminded her that it was not the church that taught that, but that these were the sentiments of some of the members. We also reminded her that one of the former woman pastors had a tat. She seemed confused and said she had never seen it. Well, it was on her low back where it would not be seen unless she was wearing a bikini. You see, the pastor was stationed in Hawaii when she was in the Navy, so she chose a traditional Hawaiian design--that tat was the talk of the district, she told me. Anyway, my husband mentioned that we no longer go to that church and the man started telling us about his pastor having tats. His church is just a few months old and small but growing and we have added it to our list of churches to visit. We had a talk with the Princess about how tats and piercings are not important and we cannot judge people by them or any other outward appearance; God looks at the heart. The man who did her piercing obviously loved the Lord even with all his tats. These are the people that Jesus loves and went out to meet. We might have passed some of our former prejudices onto her when what we meant to do was steer her away from certain desires, but now she (and we) needs to mature into be lovingly accepting of all people, who need the Lord, as He was. That sounds like such a beautiful experience you gave your daughter! And thank you for all the good info. My youngest may be requesting earrings soon (she's 11) and I never thought about allergies to the posts. My kids all have sensitive skin. I have had a terrible time with earrings. I gave up wearing them for several years because of it. Generally, people are least allergic to 14K yellow gold, but I have a friend that is allergic to yellow gold, who can only wear white gold. White gold and stainless steel have nickel and that is the metal that causes the most problem for people. I hope all goes well with your daughter!